A senior at Sacramento State University is gaining notoriety for his art project depicting police officers as pigs. The situation is reminiscent of the now infamous painting depicting police officers as pigs that hung in the halls of the United States Capitol earlier this year. The student, Jacob Lewis, said, “I need to send a message with my work rather than paint something that looks cool." An Atlanta gym has come under fire for it's policy to not allow police officers or active military service members in the gym. EAV Barbell Club owner Jim Chambers stated, "We've had an explicitly stated 'No Cop' policy since we opened, and we also don't open membership to active members of the military." Chambers' apparent reasoning for the policy is that many of the patrons of the gym are minorities and the presence of police officers might make people uncomfortable. Chambers also stated, "We wanted one space that was just a little different. It’s not an aggressive, hetero-jock space that’s dominated by cops and soldiers." He added, "And we don’t want to make police stronger so that they can hurt people more efficiently." The gym's policy made headlines recently over a sign that was placed on the front door of the business, stating, "No F----- Cops." Despite the uproar, Chambers appears committed to his gym's "no cops" policy. In the latest incident of a restaurant worker allegedly refusing to serve a police officer, a Dunkin' Donuts employee in Brooklyn is being accused of refusing to serve an NYPD officer, stating, "I don't serve cops." 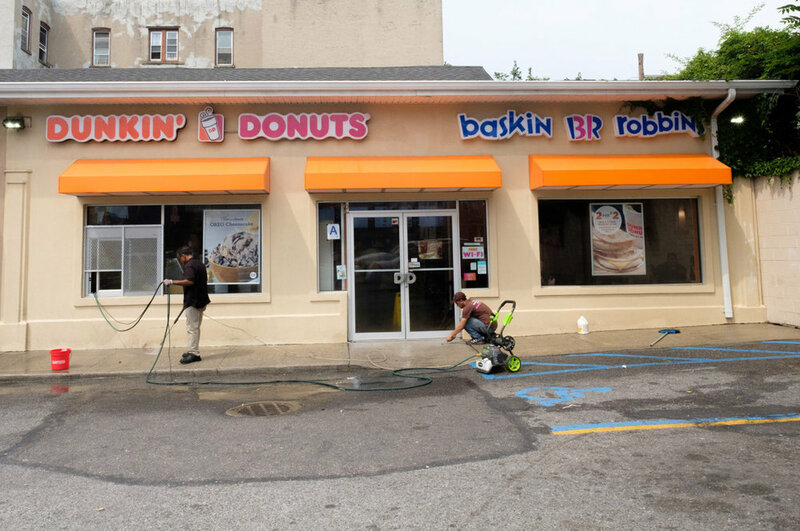 The alleged incident occurred at the Dunkin' Donuts at 1993 Atlantic Ave.
Detectives’ Endowment Association President Michael Palladino stated, “I assume it is an isolated incident. Nevertheless, Dunkin’ Donuts corporate should issue an apology to the NYPD and until that happens, I have asked detectives and their families to refrain from patronizing the stores." Two Los Banos, CA police officers were shot and wounded in a struggle with a suspect on Monday night. The officers had been called to the home to investigate a man breaking into an apartment; however, a struggle ensued after officers confronted the suspect and both officers were shot. The officers were transported to a local hospital for treatment and are said to be in stable condition. Two men have been charged in the shooting of a Chicago police officer on Friday. The assault occurred as the officer was confronting the men following a robbery in the Back of the Yards neighborhood. The officer was shot in the leg. She was transported to a local hospital for treatment and is said to be stable. The suspects, Donzell Grant, 20, and Cortez Harrington, 24, were charged with attempted first-degree murder, robbery, and other felonies. A uniformed officer with the Virginia Department of Game and Inland Fisheries was denied his food by an employee at a Richmond, VA-area McDonald's recently. The employee allegedly told the officer that, "I ain't serving no police." The event apparently occurred after Officer Scott Naff had already paid for him meal through the drive-thru. When he reached the window to retrieve his meal he was denied service. The incident became publicly known after the officer's wife shared the story on social media. Freda Thornton, the franchise manager, stated, “We regret this situation as it goes against our standards of providing a welcoming experience to everyone, and we have taken the appropriate action to resolve this situation." The NY Post reported that a Bronx teen who apparently blared a vulgar song from his apartment during the NYPD funeral services for Officer Miosotis Familia has been evicted. The teen was reported to have been playing the song "F--- tha Police" high above the funeral procession. Officers' attempts to have the song stopped were unsuccessful. After hearing about the incident the superintendent of the apartment, Danny Morales, ordered the teen removed from the premises. A Pennsylvania State Trooper has died from injuries sustained in an on-duty vehicle accident early Friday morning. The accident occurred on State Route 711 near State Route 271 at approximately 2:30 a.m.
Trooper Michael Stewart, 26, succumbed to his injuries after being involved in the accident. Another trooper was also present in the patrol vehicle. That trooper was transported to a local hospital with non-life threatening injuries.